Place cells are recorded in CA1 and CA3 fields of the hippocampus. The major afferents to the hippocampus come from entorhinal cortex. When grid cells were first described in recordings from layer 2 of medial entorhinal cortex it was largely assumed that place cell patterns arose from through a summation of grid cell inputs. Firing-rate maps of a place cell and a grid cell, averaged over a 15 minute trial. Dark blue pixels are high firing rates; yellow, zero rates. Not from this poster. Simple hypotheses aren’t always correct. 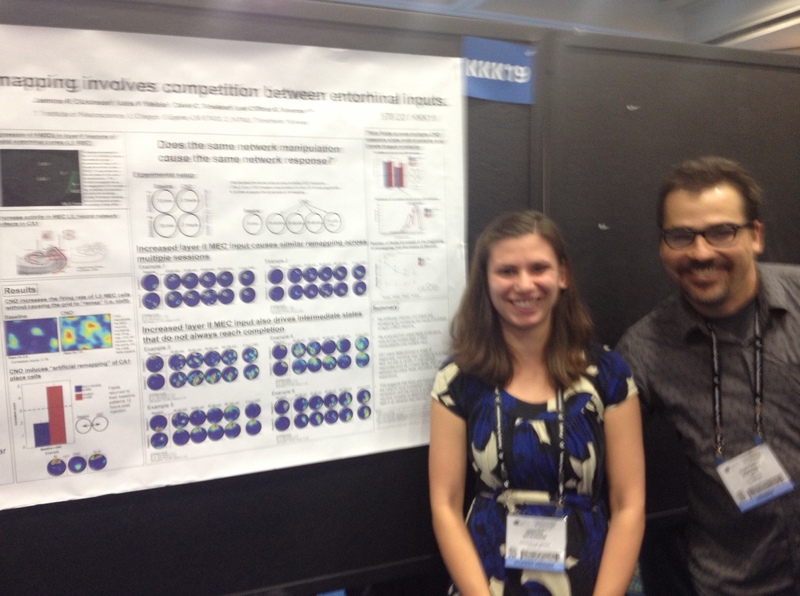 A number of studies lesioned or inactivated entorhinal cortex and found little or no effect on place cells. Dickenson et al did the reverse manipulation: they activated neurons in entorhinal cortex to super-normal levels of firing and observed effects in the hippocampus. The technique is a cousin of optogenetic stimulation. Mice were bred with a modified muscarinic receptor that could only be activated by something called CNO. When CNO is injected into entorhinal cortex, neurons are depolarized for several hours. There were two major results. First, injection of CNO resulted in enhancement of grid cell firing patterns. A particular grid cell maintained its grid pattern, but firing rates increased due to increased firing on the grid bumps. The second result was observed in neurons outside of the injected region. Place cell firing patterns changed drastically, a transform called “remapping”. In remapping a neuron’s spatial firing pattern changes in unpredictable ways. Fields can move, turn off, or additional firing fields can emerge. The remapping response lasted roughly the duration of the CNO effect. After several hours place cell firing patterns returned to baseline states. (Note: this was the general pattern; the authors say that a subset of neurons did not follow this response pattern). Has the problem been resolved? No. It’s difficult to reconcile various studies. 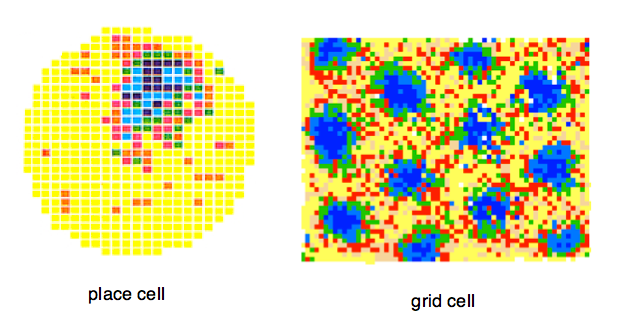 The simple answer that grid cells drive place cells has not work out. Likely, there are reciprocal connections between the population of place cell and the population of grid cells, with other inputs playing a role. But progress is being made. The Dickenson study, done by overdriving grid cells, shows that initial appearances were not totally deceiving. Projections from the Grid Cell population to the Place Cell population play a major role.